When you become a certified personal trainer, one of the first things you’ll notice is that your new clients will look to you as a fitness oracle. Keeping these health-seekers on task and motivated is at the core of your career. The Fitness Trainer Academy provides the best personal trainer certification to help you be the best. Our intensive coursework gives students a comprehensive experience of this exciting industry, from basic physiology to successful business practices. If you are considering becoming a personal trainer in San Antonio, you’ve come to the right place! Our focus on quality education helps you to pass on your knowledge in order to improve every client’s life. Today, we’ll look at a few basic tips to consider in order to keep your clients focused and on pace for success. Your clients are coming to you for a reason, and it’s up to you to get to the source of this motivation. Try to open a dialogue with your clients about their plans and goals. Being able to tap into their motivation and bridge it with your fitness program can do much to keep the client engaged and working hard. After achieving your sports nutrition certification, you can tailor the program to foster optimal diet and workout plans to best help the client. It’s key to keep your client excited about their potential for obtaining optimal health. One way to do so is to keep their focus on the long-term goals as opposed to any short-term gains. One of the biggest reasons why people fall off the fitness wagon is that they simply do not show up. In fitness, you can joke that showing up is half the battle. It’s often too easy to put off a workout if you’re too tired or too busy. As a personal trainer, it’s important to push your clients and keep them motivated in order to gain any traction. Simply showing up and putting in the effort should produce positive results, so make sure that your client does both! While our personal trainer courses will place a heavy emphasis on the importance of proper form, it’s vital to constantly correct your client’s improper techniques. Not only will doing the exercise correctly greatly reduce the chances of injury, but the process will be much more productive. Remind your clients that efficiency is better than brute strength, and keep a close eye on their form when it is their turn to try the exercise. Being able to consistently lift with proper form is essential for maintaining a quality fitness program. Becoming a personal trainer can turn out to be one of the most rewarding career choices you can make. It is essential to help your clients succeed in order to for you to succeed. 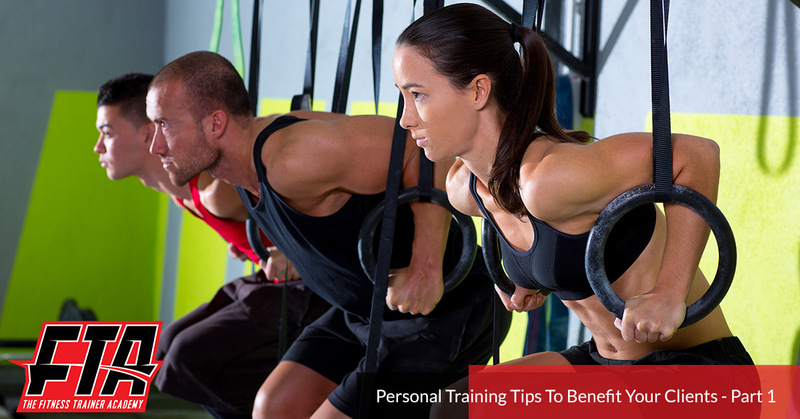 Next time, we’ll look at a few more tips that you can pass on in order to maximize your capabilities as a certified personal trainer. The Fitness Trainer Academy is here to help go-getters across this great state of Texas to take charge of their lives and thrive in an exciting industry. If you’re seeking personal trainer certification around San Antonio, feel free to contact us to get signed up for our next course today!